Have you found an online vendor selling Black Tot Royal Navy? Black Tot Royal Navy Rum is a blended, aged rum in that had been stored for 40 years in stone flagons by the British Royal Navy. The rum is part of the last rum ration served to British Royal Navy sailors on July 31, 1970 when the 300-year old tradition of a daily rum ration, or "tot", ended. Until recently when 1000 bottles were made available for public sale, Black Tot Royal Navy rum was reserved only at British Royal weddings and State functions. Very high in alcohol, it is very overpowering. Other than that, I tasted iodine and charred wood, which was the most interesting thing about this. Avoid. I love the history behind this rum and really wanted to like it however it’s a bit potent for me and my rum tasting palate. I had it over ice and it was exactly as the nose suggested and more. For me the tobacco and coffee was over powering and I could imagine drinking it whilst playing poker and smoking a cigar, however for home drinking with a friend it was a bit much. I don’t know about the leather and chocolate some have mentioned. For me, the flavor was very similar to the burnt sugar that covers a creme brûlée. And the reviewer that mentioned spending a lot of time with his nose in the glass - true! The smell is incredible. For me, there is no better rum. It was perfect. Ordered a shot without realizing it was gonna cost me $150! Interesting rum, very heavy on the treacle & coffee. I haven't cracked my bottle yet but the history behind it means a lot. It will need to be a very special occasion to crack this one, and when I do I will update if required. Great box and interesting booklet that comes with the package. Very expensive but a must for any rum collector! Sugar: Estimated at 25 GPL. Think of the Pusser's 15 year old rum and then kick up everything that rum has to offer by another 50%. This is a very complex rum in aroma and taste. Let it breath and savor the variety of aromas that flow from your glass. Wood, tobacco, leather, molasses, vanilla, baking spices like nutmeg and cinnamon, chocolate, and caramel corn. Truly wonderful to smell and the taste follows what you smell in your glass. It's a unique rum that delivers a fist pump to your palate. Very smooth and so well balanced that it hides it's 51% ABV. This is the most expensive rum that I have had the pleasure to sample. If you find it in a bar, shell out the cost of a shot. It's worth it. I would love to have this in my collection, but at $1,000 USD per bottle it's not financially responsible. Because of the cost, knowing that Navy Rum is not for everyone, and I sampled this in a flight of rums that included El Dorado 25 and English Harbour 1981, I give this a 9. I can't give it a 10 just for historical import, but it's a deeply complex specimen. Like spices and black tar and deep pungent fruit that's been rotting in the sun yet is still sweet. A little leather and tobacco. But it leaves you with a taste of caramel corn in the tail. Holy mackerel the Black Tot Royal Navy rum has an intense flavor to the nose and then the truly explosive event happens in your mouth. This is easily the most intense rum I have ever tried. Think about Pusser's 15 year old rum, but aged another 25 years. 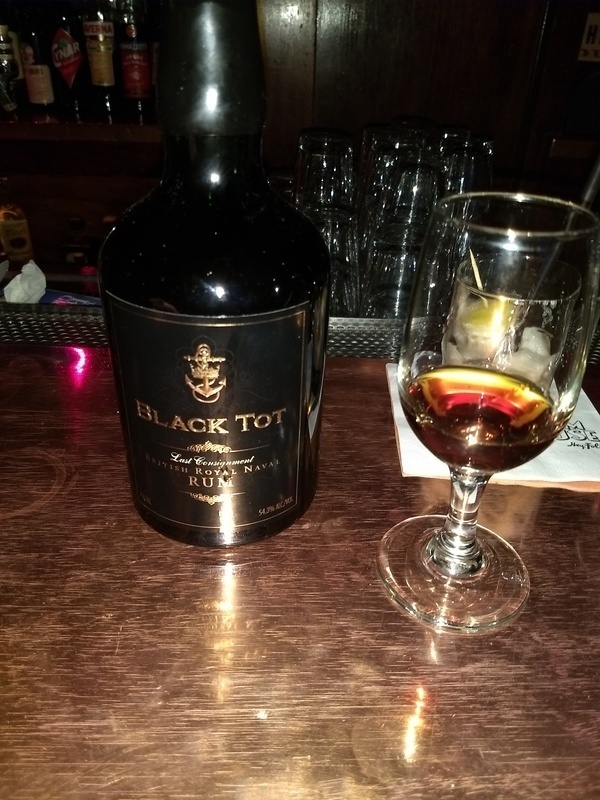 If you have a chance to sample the Black Tot, go for it, you won't regret your decision. I had a lot of flagons at one time, which went towards this blend, and kept one back. So it might not be exactly the same. The nose is fantastic. A complexity that one might not expect from a Royal Navy rum. It also possesses a great length. Rich, opulent, oaky with a nice gentle burn that belies its 54% ABV. I can put a couple of earlier reviews straight. Black Tot claim that the flagons come from bonded warehouses around the UK. The review stating that it was found in Germany, might be true I guess for some, but for many, I can confirm that they did indeed come from bonded warehouses, and in particular one in Wiltshire in the subterranean deep ex-chalk mines. And with another review saying that single flagons were in your face, high proof dogs lacking complexity isn't the case. Well at least not with mine!! I now have 6½ bottles to enjoy and am glad that I didn't have to pay the retail price for them! I look at my cabinet and see that I gave Pusser's 15yo the same 8. This is a lot lot better than Pussers 15yo, but when taking price into consideration.......!! Aged in wood for 30 years, this is a 108-proof bombshell of aromas and flavors blended from 4 of the world's most compelling rum producers (Trinidad, Jamaica, Guyana and Barbados). Overripe fruit, flowers, tobacco, pepper, tar...plus a half-dozen more...and 300 years of history...all combine to make this rum an extraordinary treat. A healthy taste will set you back $50 from MoM. Hey, baby steps. This is an amazing rum. I wouldn't want it to be the only rum I ever drink, but I'd be happy to be issued a tot or two on a daily basis, just like the pre-1970 British sailors, only forever. It's a spectacular drink, nearly perfect. Straight up all the way, right? I've had British Navy Rum from an old flagon, from the Castle Brands release of British Royal Navy Imperial Rum, and the Black Tot. In blending the Black Tot for consistency, they've really done something special. They took the bite out of the high-proof dog, and added layers of complexity. From a single flagon, the rum is in your face, with singular notes. This tasted like an aria... complex, layered. It's sweeter, but I won't count that against it. At the top. So, I had this a couple years ago at place called Hogo in DC, which is unfortunately closed now. I ponied up $50 for a one ounce pour on two occasions. Once for me, and a second time to share with a history nerd friend of mine. So, this rum is not very palatable. It has some nice notes of leather and tobacco with a backdrop of diesel.....or perhaps more like hydraulic fluid. It totally lived up to its expectations. If the military was in the business of distilling spirits, this is the product you would get. That all being said, if you get a chance to drink this.......do it! Imagine yourself toasting a victory at Trafalgar, or sinking the Bismarck, or suffering from scurvy somewhere in the south Pacific. While this is not the best rum in the world, it is a great way to celebrate and experience how rum played a small part in affecting our world. The nose of this rum is incredibly full and potent with dark chocolate, blackberries and oak. It's very nice with similar characteristics to Pusser's rum, just better. Rarely have I spent so much time just nosing a rum, eventually also picking up cinnamon. Great. The taste is exceptional, with an explosion of leather, coffee, tobaco, oak, blackberries and very dark chocolate. The potency profile falls somewhere between the ED 21 and fx. Velier port mourant 1997. Though it will give you a bit of hair on the chest, it's still very drinkable, which is unfortunate, given the slightly redicules money you have to pay for this collecters bottle. Still im leaning towards a 10, despite the overpricing, because i'm loving this. I had the occasion to taste a little of this but a little was enough, it`s an explosion of flavors, dark fruits, leather, wood, tropical fruit mash, cocoa, coffee...and the aftertaste stayed for a very very long time, i was amazed. It´s way too expensive for me to buy me a bottle though. So we all know the story given behind the guys responsible for marketing this rum and to be fair they did well (and made good money!). But, I have been made aware of a different version of events which actually means this isnt technically a navy rum at all. In fact it was found in Germany, boxed up in an used section of an army base! No-body knows where it really came from, who distilled it, what is blended in it or who's it really was...? Really rich and deep molasses flavour, but with a slight dull note which is what drags the over all flavour down. Nice story and presentation, but not on my immediate purchase list at the price it sells for. 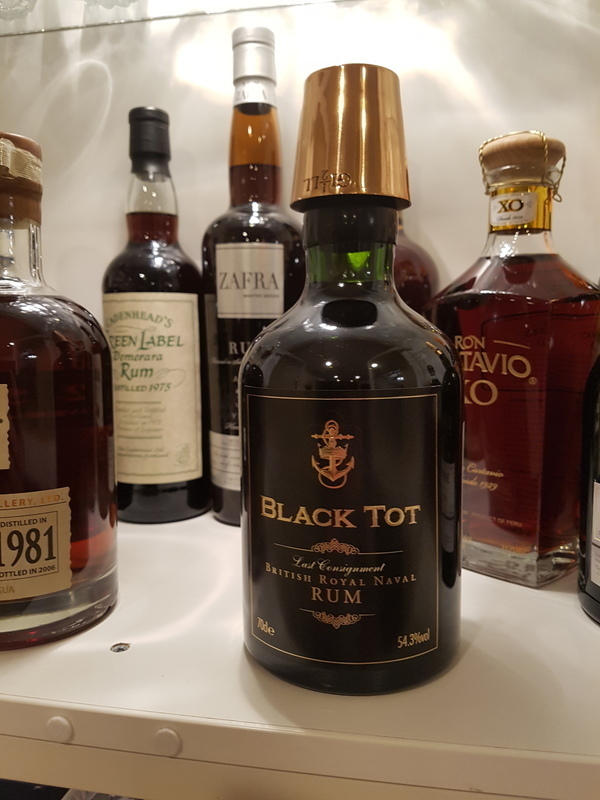 The Black Tot is a veritable explosion of flavour. A thick and heavy dark rum, with notes of licorice, it appeals to everything I like in rum. The flavour stays for longer than I had thought possible, and once we finished the tot, three of us sat around enjoying the lingering scent for well over an hour. This is not a rum I would ever buy a bottle of; nor a rum I would buy a pour of on my own, but I do feel privileged to have had the chance of sharing a tot, and would prefer this over everything else if someone else pays. I always thought that the rum given to the navy back in the day would have been fairly rough and when they went bleary eyed and said it was the best rum ever, there may have been a hint of romanticism there. After tasting I have to admit this rum is like no other. Heavy nose of molasses, treacle and winter fruits folowed by spice and coffee on the palate. There is also a lot of oak all the way through to the finish, but this is a heavy rum and holds it well. 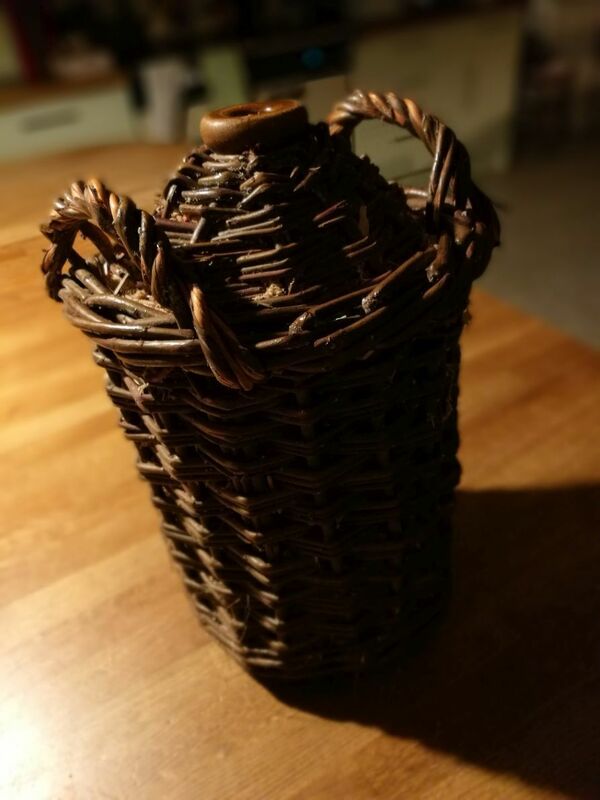 One for a special occasion as it comes with a fairly hefty price tag, but it is a remarkable piece of history you're buying along with an amazing rum.
" Starts off thick and sweet, becoming light and oaky before..."